Christmas is buried in tradition. There are traditions that are common to lots of people, like Christmas trees, presents, cards, eggnog, caroling, Advent wreaths, It’s a Wonderful Life, etc. Other traditions are unique to families. Every year I carefully place Troy in the middle of the tree. And Carolyn just as carefully waits until I’m not looking and moves him off to the side somewhere, usually down low and in the back. So she’s into fancy Christmas trees, and not into football, but nevertheless there’s just something about this tradition that doesn’t seem right. On Sunday we started decorating our Christmas tree, and I placed Troy in his usual place of prominence. Believe it or not, so far Carolyn has not moved him! However, I suspect she might be reluctant to move Troy out of respect for the Cowboys’ 11-1 record. But if Troy takes a trip around to the back of the tree, then the dainty little Cinderella globe ornament, which she places front and center each year, will be right behind him! Okay, look–there’s a big difference between saying that Troy Aikman is beautiful and saying that a Troy Aikman ornament is beautiful. So yeah, it’s beautiful. And I’m sure Troy would agree. What would be even more beautiful? A pack of his friends.. Where’s Peyton Manning? And uh.. Brett Favre? And.. Dan Elway? Um, I think you and I have very different motivations here. 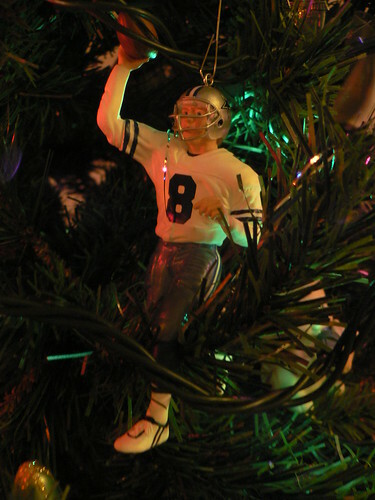 You women are starting to make me feel very self-conscious about my Troy Aikman ornament! Did Carolyn put you up to this?